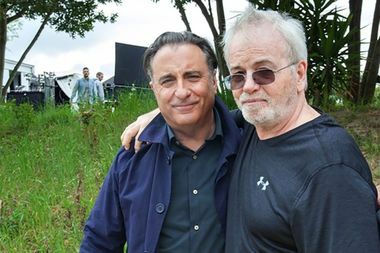 Bobby Moresco (at right) on the set of “Bent” with actor Andy Garcia. HELL’S KITCHEN — An Academy Award-winning screenwriter who grew up on West 51st Street is working on a movie about the Irish gangs who ruled Hell’s Kitchen for decades. Bobby Moresco, who penned the Oscar-winning 2004 drama “Crash” along with director Paul Haggis, is writing a script for the currently untitled film, CuffLink Productions said in a release. The movie “culminates with the rise and fall of the Westies gang, and the end of a century of violence on the West Side of New York City,” the release said. “This is a story I’ve been wanting to tell for a very long time, and I’m grateful for the opportunity to tell it now,” Moresco said. A short-lived NBC show created by Moresco and Haggis, “The Black Donnellys,” also focused on Irish-led organized crime in the neighborhood. Moresco recently finished writing and directing a thriller called "Bent," starring Andy Garcia, Sofia Vergara and Karl Urban. “Being the son of Irish immigrants right off the boat, I love the idea of making this based-on-true events film,” Cuffe said. The project is still in its early stages, so there isn’t a release date yet.